which was most certainly not part of our plan for the year. I have purposefully not talked about goals for the year because as a family we have one BHAG. That's all. Personally, instead of listing out specific goals for me, I chose to find different aspects of my life on which to work. Not to change excessively per se but to tweak for the better. Each month, I am focused on another aspect being careful not to neglect what I've just achieved. Even though there is a major push for one aspect or another, I have been issuing little tweaks along the way. My mantra is "Taking small steps to achieve big results". And I have to say, that it's working so far. January was all about our home. I felt like after living in this house for 4 1/2 years, that we had a fair amount of stuff built up that needed to find a new home. Instead of talking about it, thinking about it, or writing it down on a piece of paper to stick to our memo board, I just did it. I jumped in and decluttered and changed some habits along the way. I can't force everyone in our house to change habits on my timeline, but I can model the desired behavior and ease their habits into a tweaking of sorts. Usually I burn out after about a week's worth of my annual New Year's Clear Out and never actually finish. But this year since I have just done a little bit every day, I saw progress early on and managed to stay the course without falling short of the finish line. How are you doing with your goals/resolutions so far this year? 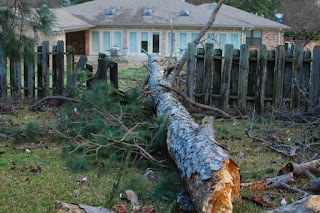 My mother is slowly clearing out all the trees in her yard, all of them over the years have become huge and dangerous! I did a major clean of my living/dining room area. The dust in this house is unbelievable! The dogs are shedding like it's summer time. I didn't have this goal at the start of the year, but I have to keep on top of this high traffic area. My goodness, glad that everyone is safe. Certainly not me! :) I am too Ms. Reed.